Porsche’s Panamera and Cayenne SUV have both been enhanced, with an improved diesel engine and new options for the Cayenne and a range of new options for the Panamera. The improvements will be available from June. The Cayenne’s 3.0-litre V6 diesel engine has been enhanced, improving its power output by five horsepower to 245bhp, while improving fuel economy and reducing CO2 emissions. 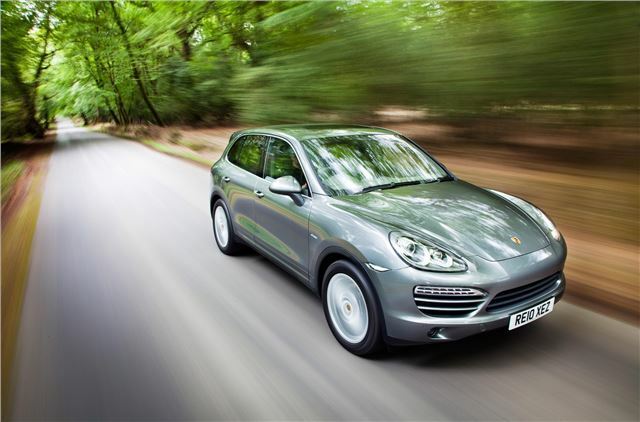 The Cayenne Diesel now produces 189g/km and can manage 39mpg. The increased power has improved top speed by two miles-per-hour to 137mph, and reduced the 0-62mph sprint by 0.2 seconds to 7.6 seconds. In order to achieve the improvements Porsche has changed some of the internal components reducing friction and weight, as well as installing a new turbo and revamping the injection system. Overall the engine weight has been reduced by 20kg. The Cayenne Hybrid has been enhanced too, and it’s now possible to drive under electric power even in cold weather, whereas before it was only possible when the engine was up to temperature. The Cayenne Turbo is now available with an optional Powerkit, which improves power from 500bhp to 540bhp, and increases maximum torque from 700Nm to 750Nm. Fuel consumption and emissions are unchanged by Powerkit. Porsche also offer ceramic composite brakes as an option, which are of a larger diameter than standard brakes. An optional spare wheel suitable for the larger brakes is available as an option. New cosmetic upgrades are available too, including tinted rear lights, Bi-Xenon headlights with black trim and quad tail pipes. Interior options include new wood choices, new stitching and leather packages, new sill guards and a milled Tiptronic-S gear selector. The Panamera has been improved too, with mobile Wi-Fi internet available from June, and a selection of new options available from the autumn, including Lane Change Assist, a system adapted from the Cayenne which monitors behind and to the side of the car and informs the driver if there is another vehicle in the next lane. The Panamera will be available with black xenon headlights and a redesigned exhaust, too. Pricing for all upgraded equipment and options for both the Cayenne and Panamera will be available closer to June.